To grow in the Lord I must let God speak to me through His Word (Chapter 4) and I must speak to God through His Son (Chapter 5). There is something else I need in order to be a strong and healthy Christian. I need to take an active part in a good, Bible believing, Bible teaching local church. The living Lord wants me to assemble together with other believers so that we can meet with God as He has instructed us in His Word, especially as found in the New Testament letters (see Hebrews 10:25). I can read my Bible ALONE in my room. I can pray ALONE in my room. These are things I can do when I am alone and all by myself. But to really grow in the Lord, I must not be ALONE by myself all the time. God has said that I need to be with other believers who want to grow also. I need to meet with other Christians who believe the same Bible that I believe and who pray to the same Heavenly Father that I pray to. I need to get together with people who really care about each other (John 13:35) and who are able to R_______________ with them that do rejoice, and W___________ with them that weep (Romans 12:15). Just like a hand needs an arm and the rest of the body to work rightly, so the believer needs the Body of Christ which is the Church. How well would your hand do without the rest of your body? That is how well a believer would do without the church! A student who doesnt go to school. A soldier who doesnt join the army. A sailor who never gets on the ship. A baseball player without a team. Therefore, GO to Sunday School! GO to the Morning Worship Hour! GO to the Evening Service! GO to Prayer Meeting! As believers in Christ we have all been BORN-AGAIN (John 3:3,7) into the same FAMILY and we are all the _______________________ of God (1 John 3:10). As members of this special family, how many FATHERS do we have (Ephesians 4:6)? ______ We are part of the same family; we have the same Father and we all share the same LIFE (1 John 5:11-12). All of Gods children have Gods life, which is eternal life. Family members need each other! What if your earthly father had put you out the door at age six and said to you, "From now on youre going to have to make it on your own!" Children need to be part of a family! Gods children need to be part of Gods family. God's perfect plan is that we should be part of the family of God. We should not isolate ourselves from our brothers and sisters in Christ. I need them and they need me. 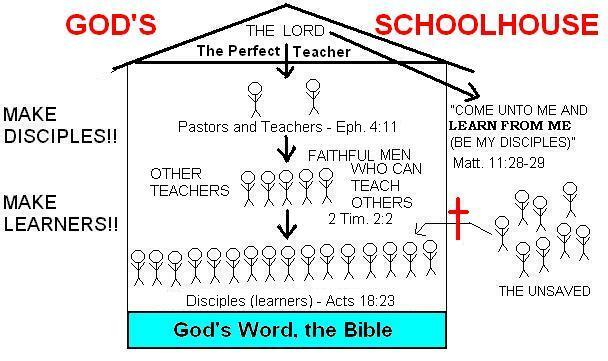 The Church is Gods Schoolhouse and in this Schoolhouse there are both TEACHERS and LEARNERS (or DISCIPLES). A disciple is someone who learns, a learner, a student, a pupil. The disciples learned from Christ who was their Teacher. Suppose a young person attending school were to say, "I dont need to go to school to learn. Ill just study my school books on my own. I dont need to go to School. I dont need school teachers and I dont need to be with all the other students." Do you think this "stay at home" idea would really be the best way to learn? Suppose a home schooled child should say, "Why do I need to stay at home to learn? Why do I need my Mother to instruct me? Why can't I just sit by the lake and fish and hopefully I can absorb knowledge in this way." Believers are not wise when they stay away from Gods Schoolhouse and from God, the perfect Teacher! Not only is the Pastor a teacher (see Ephesians 4:11), but he is also a SHEPHERD. The word PASTOR means "SHEPHERD," one who cares for and watches over the sheep. How well would sheep do without a Shepherd? Just as sheep need a shepherd, so believers need a Pastor. Who is the Great Pastor and Shepherd (see Psalm 23:1; John 10:11 and 1 Peter 5:4)? __________________________________ God has also gifted certain men to be Shepherds and Pastors over local churches. Who is your Pastor? ____________________________ Pray for him! Learn from him! Be a healthy and growing sheep! The Church is the body of Christ and every believer is a member of this body: "Now______ are the body of Christ, and _________________ in particular"
One of the most wonderful things about the human body is how well it works together. All the parts of the body function together, helping and supporting each other. My lungs take air into the body. My brain, muscles and bones help my lungs. In order to move, my bones need help. My muscles help my bones to move. My brain thinks and sends messages to all the parts of my body. My brain needs oxygen which it gets from my blood. My bones, muscles, brain, lungs, heart, nerves, and stomach all help each other. Do these comparisons to the body help you to understand 1 Corinthians 12:14-27? Every member of the body is important! If you are saved, you are important and you are needed in the church. Think again of your human body. Would you want to be without your right thumb? Would you want to be without your left ear? Would you want to be without your liver? Every part of your body is important and is needed! Who makxs a Church a succxss? Xvxn though my typxwritxr is an old modxl, it works quitx wxll xxcxpt for onx of thx kxys. I havx wishxd many timxs that it workxd pxrfxctly. Its trux that thxrx arx forty-six kxys that work vxry wxll, but just onx kxy not working makxs thx diffxrxnce! Somxtimxs it sxxms to mx that our Church is somxwhat likx my typxwritxr--not all thx kxy pxoplx arx working propxrly. You may say to yoursxlf, "Wxll, I am only onx pxrson. I wont makx or brxak thx Church." But it doxs makx a diffxrxncx, bxcausx to bx xffxctivx, a Church nxxds thx activx participation of XVXRY pxrson! So thx nxxt timx you think you arx only onx pxrson and that your xfforts arx not nxxdxd, rxmxmbxr my typxwritxr and say to yoursxlf, "I am a kxy pxrson in thx Church, and I am nxxdxd vxry much!" The Church is like a team! Have you ever watched a basketball game where there was only one player on the winning team? NO! One player is not a team! A basketball team is made up of five players on the floor, several more players on the bench and the coach. Everyone is important and everyone is needed. Even the players on the bench are important. Why is this so? The local church is the household of God. The local church is Gods Schoolhouse. The local church is the body of Christ.